To me, RadioBook Rwanda reads and sounds like a documentation of the Rwandan way of living. When I engage with each of the stories, I can see them expanding from the author’s eyes and making tangible everyday life of the Rwandan community. Each one of these three stories was written by a writer in his or her early twenties, but these are stories that connect across generations. In ‘Waiting for Words’ Mutsinzi Eric writes a couple navigating the expectations of married life. While the main characters in Annick La Reine Shimwa’s ‘The Sykes are Woke’ might be young people, the conflict these characters have to overcome originates from the politics of an older generation. Then, there comes Jimmy Tuyiringire’s story. His narrator is forty-five years old, and tells a story with roots that go at least a hundred or two hundred years back in Rwandan history. These three works of fiction are just one aspect of RadioBook Rwanda, a multimedia literary imprint that combines words and art, print and audio. But the reach of these stories across generations, sets up the scale of the universe RadioBook Rwanda brings to life. At this moment, I yearn for every Rwandan living soul, wherever they are in this world, to hear or read these stories because the project hasn’t left anyone behind. From the outset, this project was to be carried out and presented in both Kinyarwanda and English. 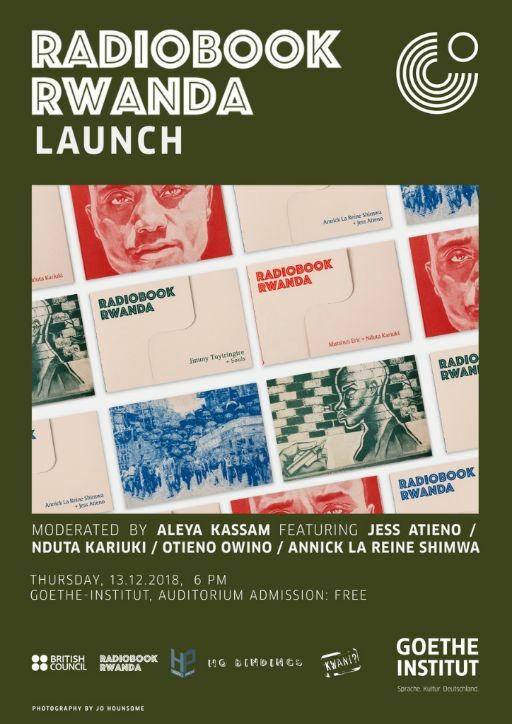 RadioBook Rwanda has been created by three publishing houses – Huza Press in Kigali, No Bindings in Bristol and Kwani Trust in Kenya – and so the work has continually been collaborative. However, we all brought different expertise and my particular role was to engage with RadioBook Rwanda as a Kinyarwanda speaker, and more importantly, as a person who can go back and forth between the two languages. Back in December 2017 we released the ‘Call Out’ for artwork by Kenyan and Rwanda artists, and for writing by Rwandans in Kinyarwanda, French or English. The English stories could be read by the whole in-house team, but my first intensive task on the project was to read and provide comments on the submitted Kinyarwanda stories. One of these stood out to me and to the rest of our Kinyarwanda reading team. We collectively decided to publish ‘Umuhigi w’Inkuba’ by Jimmy Tuyiringire and, when Denyse Umuhuza began working on the English translation of this story ‘The Thunder Hunter’, I was also able to read and share feedback on the translation. Before long, I was acting as a copy editor and proofreader of the Kinyarwanda stories and text. I had never done anything like this before but through the RadioBook Rwanda project I found myself taking on roles within publishing I’d never thought about before. I must have done well because I was later told that I had good editorial instincts. Joy! Another crucial aspect of this project is the sound. 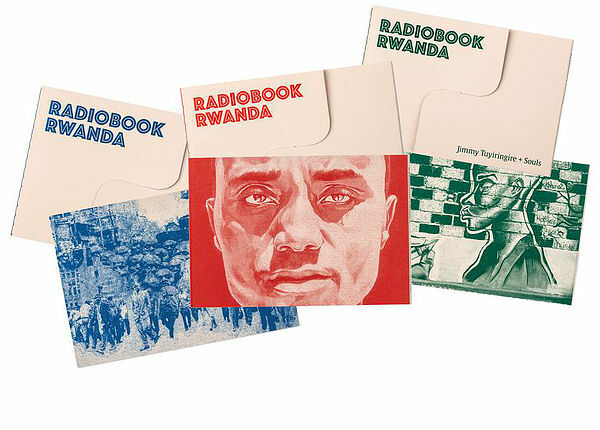 If the first wave of RadioBook Rwanda is a planet, the text and the artwork live on the same continent, and then the audio is another continent. RadioBook Rwanda has the artistry of No Bindings woven all around it through the book design, the printing, the handcrafted binding, and the sound. So, No Binding’s Sound Director Eloise Stevens flew to Rwanda so that we could work on the ‘radio’ aspect of the project together. We put our heads together, along with Huza Press’s Director Louise Umutoni, in order to find suitable sound actors for the audiobooks. We selected a stellar cast of some of Rwanda’s most exciting creative voices: Natacha Muziramakenga, Umuhuza Denyse, Malaika Uwamahoro, Emma-Claudine Ntirenganya and Kimenyi Hervé. And then Eloise told me that I was to direct the recording sessions of the Kinyarwanda audiobooks! Again I’d never done anything like that, so I was stunned. She reassured me, and then we began getting ready. She walked me through sound directing, gave me exercises, and before I knew it, there we were, in a studio, and I was giving directions to our Kinyarwanda sound actors. But that was not all. The recorded files had to be edited for publication and well, I did the directing, so I also had to be a sound editor! Alongside the audiobooks we wanted the RadioBook Rwanda podcasts to include interviews and conversations. We decided to record conversations with Rwandans who are or have explored similar themes to those of the stories in the series. So, Eloise and I made calls looking for people who would be willing to share their personal stories. We found them and took trips to interview them. For the green book with the theme ‘modern myths’, we went to Musanze to visit Jimmy Tuyiringire’s two grandmothers; and for the red book’s theme, relationships, we found a married couple in Kigali who were even eager to share their personal stories about the concept of communication between two married people. For the blue book with the theme, resistance, Eloise and British Council’s Hyppolite Ntigurirwa went to visit his mother as a woman who took on the role of leadership after the tragedies of 1994. 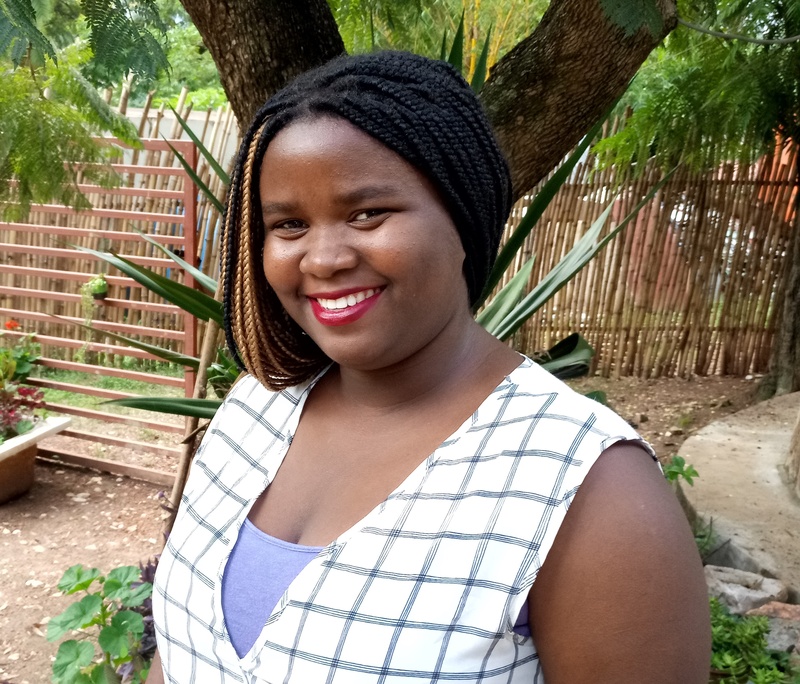 Back then people’s hearts were filled with grief and trauma, but she stepped up in ways that are evocative of Shama ̶ the main character in Annick La Reine Shimwa’s story. Not all of our subjects could speak English. So, there I was sitting between Eloise and Dative, an interviewee, and I was interpreting. I remember a story she shared about a small conflict she had with her husband that grew to become so big they spent two days without talking to each other, even though they lived under the same roof and slept in a single bed. As Dative was orally demonstrating about communication in a marriage, she got so carried away that she talked for nearly five minutes without pausing for me to interpret. When she finally finished, I laughed because I had no idea how I was going to interpret all of that in a single breath. I had never really acted as an interpreter in a work context before. So, I decided to wing it, and then there I was, talking and talking and four or five minutes passed! In day-to-day life, I wouldn’t have pictured myself being a copy editor, a proofreader, an interpreter, a presenter, a sound director and a sound editor all for a single project. And maybe, had I stopped and thought about all of those things before I carried out these roles, I would have terribly failed at them. So, RadioBook Rwanda became a gift, an opportunity for me to learn and do at the same time, something that is rare. 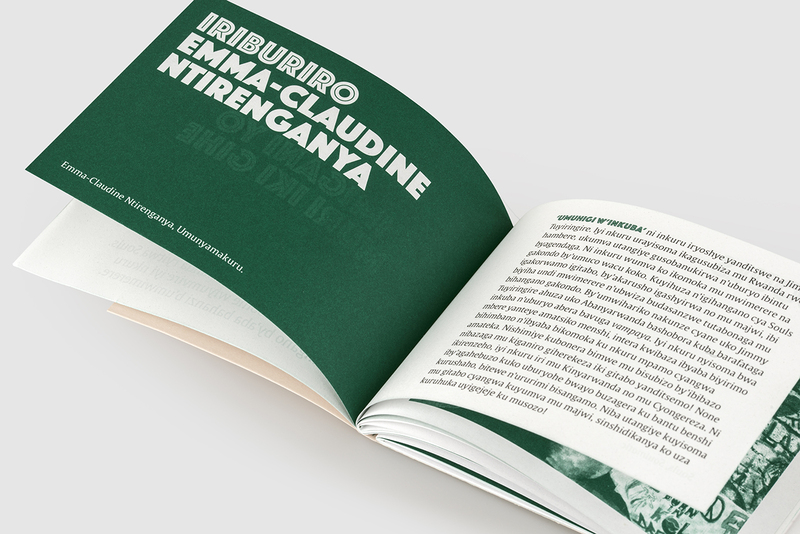 The format of RadioBook Rwanda was designed with a Rwandan audience in mind out of conversations with young people about how they like to access stories. The Huza Press audience in the past has been an English-speaking adult audience, but this time around we have thought carefully about how to reach across generations. In addition, since Rwanda is a multilingual country but our shared national language is Kinyarwanda, the stories are available in Kinyarwanda across print and audio. Rwanda has a rich oral storytelling tradition and the majority of Rwandans love radio dramas, so the stories are available for free as audiobooks. We know that our people all over the country like to sit together, maybe snuggle by the fire, for about an hour before they go to sleep, in order to listen to ikinamico (radio drama). We have made this project accessible in every possible way so that if you don’t want to read the stories, you can listen to them. And we know that you love listening. In this way, everybody wins. A couple that we interviewed for the red book about communication and trust in a romantic relationship talked about scandals that occur in several neighbourhoods because a wife and a husband do not have a stable communication system. Dative drew a scenario of a wife and a husband arguing so loudly that the neighbours come out to watch. She also drew another scenario where wives or husbands confide in their best friends about their spouses’ faults and undesirable behaviours; predictably, the friends do not keep those secrets, instead they spread them all around, and the problem grows bigger and involves a lot more people when the fire could have simply been extinguished had the couple just talked to each other. Through Mutsinzi Eric’s story ‘Waiting for Words’, we hope to initiate conversations about communication and trust in relationships. Through ‘The Thunder Hunter’ we hope people will be inspired to take a look and bring back the stories of the old, the tales that only the people in the villages know. Through ‘The Sykes Are Woke’ we are hoping to elevate the stories of the intellectually, physically and emotionally valiant Rwandan women of the past and of the present. In addition, this publication marks a new era of literature in Rwanda and a new way of sharing that literature through our relationships with No Bindings in Bristol and Kwani Trust in Nairobi. We have so many beautiful stories to tell. The ways we live in this country have been obscured by several things for several years. This project gives a glimpse at Rwanda through a longer historical lens, before the strain of political and racial conflicts that broke our back. This project gives a glimpse of our many stories. Read, listen, see, share and let us know what you think! Lucky Grace Isingizwe is a writer, a literary producer for Huza Press and a student at Mount Kenya University Rwanda (Bachelors of Arts in Communication and Mass Media). Her short story ‘The Weaving of Death’ was published in the 2018 Caine Prize Anthology Redemption Song and Other Stories. Her short story ‘Beyond Repair’ was shortlisted for the Huza Press 2016 Prize for Fiction and will be published in 2019. Lucky Grace works with Huza Press as a content creator and social media manager. She also works with Pages, an online bookstore based in Kigali as a distribution manager. She is an Amplify II Fellow at aKoma Media and she participated in the African Writers Trust Publishing Fellowship 2018. Radiobook Rwanda is a new multimedia literary imprint, showcasing Rwandan and East African creative voices. The imprint is the brainchild of three publishers: Huza Press (Rwanda), Kwani Trust (Kenya) and No Bindings (UK). The first three ‘radiobooks’ are being launched in Bristol, Nairobi and Kigali over November, December and January. The Nairobi launch takes place tonight at the Goethe Institut where Aleya Kassam is in conversation with editor Otieno Owino, artists Jess Atieno and Nduta Kariuki and writer Annick La Reine Shimwa. More details of RadioBook Rwanda’s homecoming Kigali event coming soon! In the meantime start listening to the podcasts being released weekly on SoundCloud here.